The Red-eared Slider is a freshwater terrapin that is native to the Mississippi River Basin of North America. This species gets its name from the red stripe behind its eye, and its habit of sliding off rocks or logs into the water when it is startled. The rest of the head and legs are dark with yellow stripes, and the shell is greenish brown. Red-eared Sliders can grow up to 20 cm (8 inches) long. Red-eared Sliders are commonly kept as pets, which is how they arrived in Bermuda. Through irresponsible pet ownership, these terrapins can now be found in every freshwater or brackish pond in Bermuda. They have even been spotted in the heavily polluted Pembroke canal. Red-eared Sliders are also frequently spotted on golf courses where they make their homes in the ponds and bury their eggs in the sandy bunkers. One way they got there is by escaping from poorly constructed enclosures. Red-eared Sliders are able to climb and burrow. If they are kept in crowded conditions or cannot find a mate, they will escape to find a more suitable home. They can smell fresh water and will follow the scent to a new pond. Sometimes these escaped Sliders can be found on the side of the road or turn up in people’s gardens. Most of the Red-eared Sliders in Bermuda’s parks and nature reserves were dumped their by pet owners who no longer wanted them. One Slider added to a pond may not upset the ecology, but people have been adding their ‘one Slider’ to Bermuda’s ponds for decades and now most ponds contain several hundred. Rest assured if you release your pet, it will find a mate and be producing clutches of eggs in no time. If you no longer want your terrapin, make the responsible choice and have it put down by your veterinarian. The Red-eared Slider is considered one of the worlds top 100 worst invasive species. This species is highly adaptable, and even tolerates the slightly salty (brackish) conditions found in some of Bermuda’s ponds. Red-eared Sliders have devastating impacts on pond ecosystems because they eat almost anything including water plants, molluscs, insects and small fish. In Bermuda they eat the Killifish and the Mosquitofish (Gambusia) which keep the mosquito numbers down. This has serious implications for human health because of mosquito-bourne disease and general wellbeing – no one likes mosquito bites! The Killifish are also endemic to Bermuda and endangered. Like all reptiles, Red-eared Sliders are cold blooded, so they must pull themselves out of the ponds and bask in the sun to warm up their bodies so they can properly digest their food. Unfortunately one of the Sliders preferred basking places is on top of the water level nests of wetland birds, such as the American Coot andMoorhen. Sliders are known to crush bird eggs in this way; they also have been known to eat the chicks. 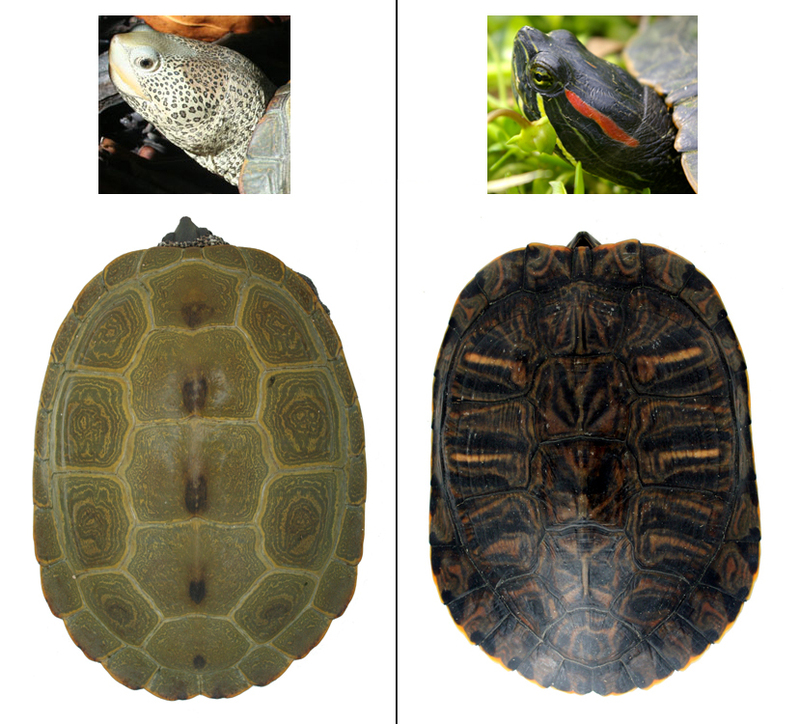 The impact of the introduction of Red-eared Sliders on other pond species, like the native Diamondback Terrapin, is unknown. However it is clear that with no predators to keep the population in check, the Red-eared Sliders are significantly upsetting the ecology of Bermuda’s ponds. These are the only two pond turtles currently living in Bermuda’s wetlands. The red-eared slider is far more numerous, living in over 20 different fresh-brackish water ponds and canals across the island, and can easily be identified by observing the red stripe that runs behind each eye along the side of its head.